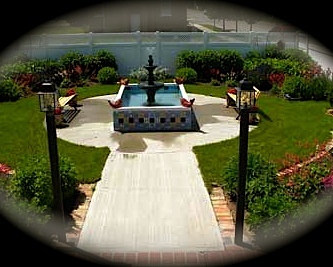 Landscape design makes a garden look appealing, aesthetically pleasing, and adds value to a property. The principles of landscape design are the science of landscaping and one of the building blocks used when designing an outdoor space. Unity - Unity is achieved by linking the elements of landscape design to create harmony and consistency with the main theme of a landscape design. The idea is to create a unified look where everything fits together. You can create unity by repeating lines in your landscape design and using trees and plants with similar colors, shapes, and textures. Balance - Balance gives a landscape design visual appeal and a sense of symmetry. Balance can be symmetrical, asymmetrical, or perspective. You can create symmetrical balance by placing trees and plants of the same type, mass and weight in exactly the same position (mirror image) on both sides of the center axis of your landscape design. With Asymmetrical balance trees and plants of different color, form and texture are used on each side of the center axis to create the feeling of balance even though each side looks different. You create this type of balance by using masses of plants that appear to be the same visually rather that in total mass and weight. Perspective balance is used to achieve a visual balance between trees and plants in the foreground, mid-ground and background of your landscape. 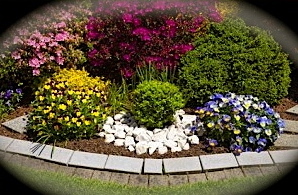 Transition - Transition creates smooth and even visual movement in your landscape design. Plants and trees with different sizes, textures, forms and colors should be arranged in a gradual balanced (ascending or descending) progression to create visual continuity. Proportion - Proportion refers to the size of an object in relation to other objects in the landscape. A balanced (different sizes) selection of plants, trees and shrubs will help you create proper proportion between the elements in your landscape design. Rhythm - Rhythm creates the feeling of motion in a landscape design. Repeating forms, lines and color schemes will create rhythm in a landscape design that is enjoyable and relaxing. Focalization - You can create focal points to draw visual attention to special or interesting sections of your landscape design with the use of lines, form and balance. Garden fountains, sculptures or interesting plants make good focal points in a landscape design. 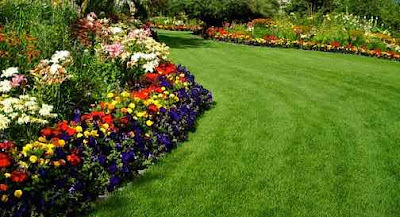 Repetition - Repetition in landscape design is the repeated use of elements with identical form, color, shape or texture. 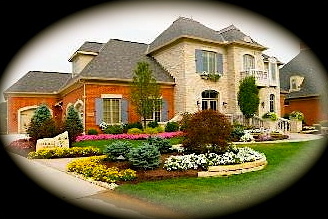 Proper use of repetition will enhance the rhythm and the focalization of your landscape design. Use the elements and the principles of landscape design to help you create an enjoyable, relaxing and visually pleasing outdoor space.